skillet, originally uploaded by Seligmans Dog. When I cook bacon, I alter the (gas) burner real low so the bacon slowly renders its fat, becomes nice and crispy and the fat doesn't splatter all over the stove. It's a slow process that recently made me think about the heat source. I've often wondered if a pan goes on a burner, does it constantly go up in temperature, or does it level off? 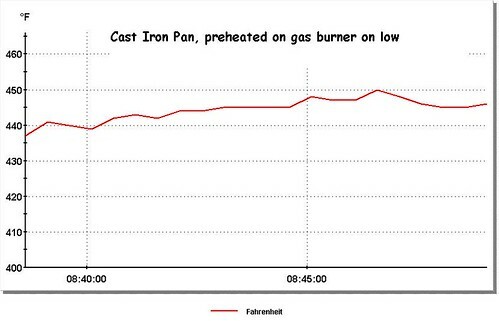 Given that ignited natural gas must be over a 1,000F or so, I wondered what temp a skillet would get at vaious levels of gas on the burner. I fired up a cast iron skillet and sandwiched a thermocouple probe on the surface with another smaller skillet to hold it securely on the surface. After a long pre-heating at a setting of 3 out of 8 on a 10K BTU burner, I was amazed at the stability of the temperature. The y-axis is expanded quite a bit and the duration of this brief, but not trivially short, test is over 10 minutes. Seems kind of trivial once the data's in, but I couldn't figure it out before doing the expt. This post should make my last 5 readers run for another blog. Doctor Fire for a well-documented piece on flame temperature determination. I have allways wondered about that too. I loaned out my thermocouple probe to a friend, so I was unable to conduct this observation myself. Thanks for doing the work. I am going to fire up my cast iron skillet and cooks some bacon for research. Hey Chile! Bacon is always a great place to start research. The Tim Man! I think Jason was the one that stuffed a couple probes in my bag when I left. He played the game on me. Uh Dave, as long as you continue to throw in the occasional "thermocouple probe" post, I will always read your blog. I mean how cool is that?! BUT, there's no readout real time. It's all stored and you get it later. Kind of a bummer if you want a real time readout. It's surprisingly useful if you like to substantiate your observations with data. I've mapped the oven temp in a few positions, etc. So many people give unsubstantiated generalizations; I like to really know, with confidence, I can support what I say. Measurement is fun too. Glad you're on the same wavelength. At least there's two of us reading regularly. Hmm, I find it easier when slow cooking the bacon to put it on a cookie sheet in the oven. No splatters on stove and you can set the temp to anything you want. Today, will be putting a few pounds in the smoker!